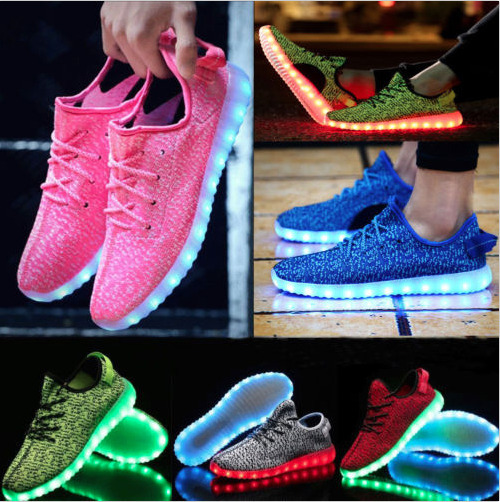 eBay Unisex 7-LED Light Lace-up Luminous Shoes Sneaker Sportswear USB Re-Chargeable Note: Please see above size chart photo for size conversions Features: · 100% brand-new and high quality· Press LED button to turn on/off & switch into different colors· USB re-chargeable design, unique and durable· USB charging time is approximately 4 to 5 hours· USB port can be hidden behind sticker patch when not charging· LED lights – 7 colors, 4 different modes, all change in one click of the button Package Included: · 1 Pair of Shoes (Without retail packaging) · 1 x USB Charging Cable PaymentPayPal onlyWe ship when you make your payment. The sooner, the better We only ship to PayPal confirmed addresses. For international buyers, we only ship to Verified PayPal users. So please, verify your PayPal account before you make your bid. Thank you. ShippingCurrently we ship to the lower 48 contiguous U.S. States, we DO NOT ship to APO/FPO Addresses, Guam, Northern Mariana Islands, Puerto Rico, U.S. Virgin IslandsWe ship Monday to Friday. Saturdays, Saturdays and Holidays are dependent on the carrier (USPS, FedEx)Our warehouse is located in Walnut, California, U.S.A. We do not offer in-store pick-up and exchange service.The shipment usually takes 2-5 business days (Saturday and Sunday excluded) If you need the item urgently, please contact us before purchasing. Returns & Claims All items have a 2-month warranty. Contact us for details. Contact UsOffice Hours of Operation:Monday - Friday: 9:00 am - 5:00 pm PST/PDT We are dedicated to making your buying experience as smooth and satisfactory as possible. Send us an email or an eBay message for any assistance. In case of last minute color changes, we read all eBay notes before shipping.